Garson, G. D. (2013). The Literature Review in Research and Dissertation Writing. Asheboro, NC: Statistical Associates Publishers. 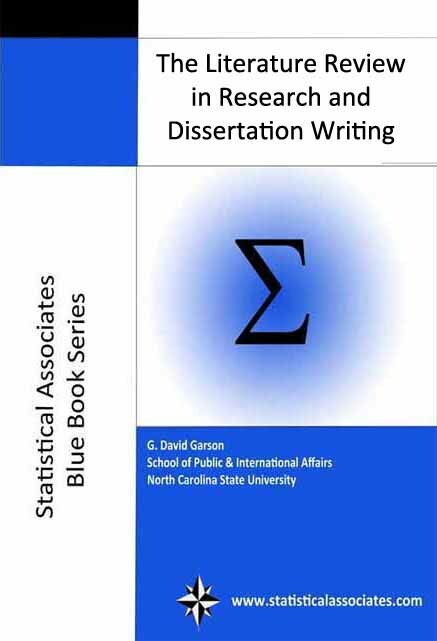 @c 2013 by G. David Garson and Statistical Associates Publishers. worldwide rights reserved in all languages and on all media. Permission is not granted to copy, distribute, or post e-books or passwords. A concise, illustrated introduction to writing the literature review for scholarly articles and dissertations, including coverage of search strategies, search engines, style guides, bibliographic management software, qualitative meta-analysis, integrated research reviews, and more.